Horseback Riding Lake Worth: How We're Awesome Like A Flamingo! If you ask the average person for an interesting fact about flamingos, they probably can’t give you one. If anything comes to mind, they’ll probably tell you that they’re not naturally pink but instead pick up the color from their diet. While it’s true that flamingos are born gray and get the pink from a dye called canthaxanthin that’s in the shrimp and algae they eat, that bit of trivia is getting to be pretty well-known. 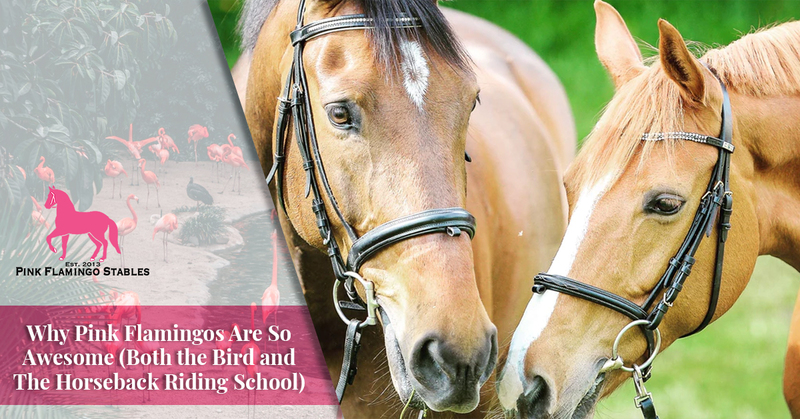 The fact is, flamingos are much cooler than that little tidbit…and so is the Pink Flamingo Stables horseback riding school in Lake Worth! Wait, how can flamingos be that cool? And is one horseback riding school any different from the next? Yes and yes! Let’s take a look at a few reasons why. Flamingos (The Bird) Can Drink Boiling Water! There aren’t too many animals you can look at and say “they can drink the water from a whistling tea kettle,” but flamingos can! Now you might be wondering, how did anyone find this out? Was it some cruel practical joke someone was playing on them that failed? As it turns out, nature biologists learned this from watching flamingos in their natural habitat. Some of the birds live in areas where the only available freshwater is from geysers, boiling-hot thermal pools that are heated from underground magma chambers. While it’s too hot for anything to live in the water (except for extremophile bacteria), the birds are able to stay hydrated because they can drink such hot liquids. Given the choice, Flamingos are going to drink freshwater like any other animal would. And if that water happens to be from a boiling geyser, so be it! But sometimes flamingos live in areas where freshwater isn’t available. In Africa’s Great Rift Valley, water evaporates from bodies of water so quickly that it leaves behind a high salt content (much like the Dead Sea). These salty and brackish water supplies are so salty that no animal will bother with them…except the flamingo, of course! Flamingos have special glands near their nostrils that help them excrete the salt, ensuring that the salinity of their bodies remains constant. Flamingos (The Riding School) Rides Rain Or Shine! While the water falling from the sky might not be boiling or filled with salt, we’re still going to brave it at our riding school! In general, we’re going to ride rain or shine. Of course, if it’s hurricane season and something pops up, we’re not going to endanger either our guests or our horses. In such a case, we’ll reschedule your ride for a different time. Flamingos (The Bird) Can Get Frozen In Ice! Flamingos spend most of their time kicking up the bed of a lake with their large webbed toes in order to get food. But spending that much time in the lake has its consequences. While we tend to think of flamingos as being warm-weather birds, the Andean flamingo lives high in the Andes mountains where the temperature gets extremely cold. In such cases, the ice can actually freeze around the flamingos’ legs, trapping them until it thaws the next morning. What does the flamingo think of this? While we can’t be certain, it seems that they don’t really seem to care! The scales on their legs make them incredibly robust, and they don’t suffer any ill effects from being frozen overnight. Flamingos (The Riding School) Never Get Iced! While there’s sometimes inclement weather, you’re not going to show up to a horseback riding lesson and discover that “it’s too cold to ride.” That’s just one of the advantages to being so near the coast here in Florida! Flamingos (The Bird) Are 6 Different Species! If you hear the word “flamingo,” there’s probably only one creature that comes to mind. But there are actually six types of flamingo: Lesser flamingos, Andean flamingos, James’ flamingos, Chilean flamingos, greater flamingos, and the American flamingos. You probably won’t be surprised to learn that the kind you’re going to see in the wild in Florida are the American flamingos (sometimes called the Caribbean flamingo). Here are Pink Flamingos Stables, we have three specialties which constitute the primary reasons that people stop by. Trail Riding – If you’re just looking for a fun activity for a morning or afternoon, it’s hard to beat our trail riding! You’ll get to see areas of Lake Worth that most people don’t as we make our way along the back trails and roadways. Whether you live in the area, are on vacation, or are looking for an office retreat activity, our trail riding stables are ready to show you some adventure. Riding Lessons – It doesn’t matter whether you’re new to horses or if you’ve ridden all your life — we’ll teach you something you don’t know. If you are just in it for the fun or are interested in showing horses professionally, we’ll guide you on your journey during riding lessons. Imagine if you spent four to eight hours a day combing your hair or taking a shower. That’s a necessity for flamingos, who spend a good part of their day cleaning their feathers. Special glands produce an oil that protects their feathers and helps keep them healthy and ready to fly. Grooming a horse is very important, and it’s something we’ll teach you about during horseback riding lessons. Grooming a horse helps to keep their coat shiny and even, and it also gives you a good chance to check for problems (such as ticks or nits) that might have taken hold on the coat or in the tail. Of course, the importance of bonding can’t be ignored during grooming. The closer a horse and rider are, they better team they’ll make when they’re out for a ride. While we don’t have any flamingos to admire at our riding school, we can definitely show you the amazing things that a horse can do. Whether you are interested in horseback riding lessons, a birthday party, or a quick trail ride, we look forward to meeting you. Schedule with Pink Flamingo Stables today!